The divergence in the demographic trajectories of Germany and France will have a major impact on social spending, labour markets, productive capacity and the sustainability of public debt in the two countries. The implications are crucial in particular for understanding Germany’s concern about its debt. These demographic differences will require the implementation of heterogeneous policies in the two countries, meaning that the days of a “one-size-fits-all” approach are over. The demographic trajectories of France and Germany are the product of Europe’s history, and in particular its wars. 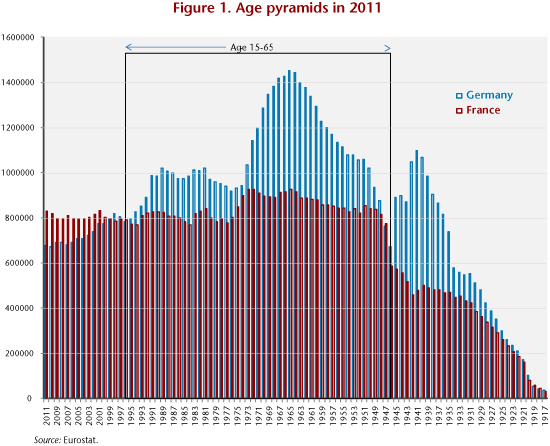 The superposition of the age pyramids (Figure 1) is instructive in this regard: in Germany the most numerous generations are those born during the Nazi period, up to 1946; then come the cohorts born in the mid-1960s (the children of the generations born under the Nazis). In contrast, in France the 1930s generation is not very numerous. As a consequence, the baby-boomer generation which, as can be easily understood, kicked off earlier than in Germany (starting in 1945, at a time of a baby crash in Germany that ended only in the early 1950s, with the German baby boom peaking somewhat late, in the 1960s), was limited in scale, as people of childbearing age were not numerous. On the other hand, the birth rate in France slowed much less in the wake of the 1970s crisis, and most of all it has risen again since the early 1990s. This has resulted in the fertility rate remaining close to 2 children per woman of childbearing age, so that the size of the generations from 1947 to the present has remained virtually constant. German reunification led to a collapse in the birth rate in former East Germany, which converged with the rate in ex-West Germany in the mid-2000s (Figure 2). 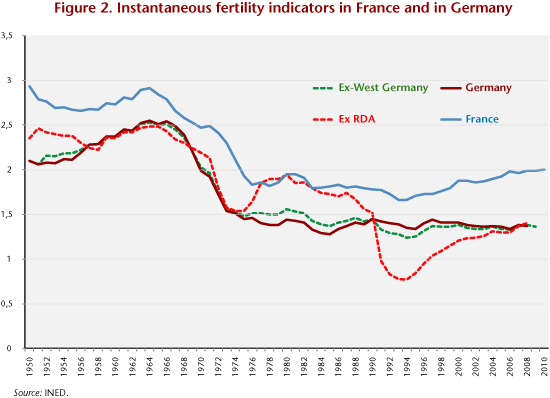 Overall, French fertility has generally been higher than German fertility in the post-war period, with the gap widening since the early 2000s. As a result, the number of births in France is now substantially higher than the number in Germany: in 2011, 828,000 compared with 678,000, i.e. 22% more births in France. From a demographic standpoint, France and Germany are thus in radically different situations. While France has maintained a satisfactory fertility rate, almost sufficient to ensure the long-term stability of the population, Germany’s low birth rate will lead to a substantial and rapid decline in the total population and to much more pronounced ageing than in France (Figures 3 and 4). According to the population projections adopted by the European Commission , Germany should lose more than 15 million inhabitants by 2060, while France gains just under 9 million. By 2045, the populations of the two countries should be the same (a little under 73 million), while in 2060 France will have approximately 7 million more people than Germany (73 million against 66 million). Migration is contributing to population growth in both countries, but only moderately. Net migration has been lower in Germany during the most recent period, with a rate of 1.87‰ between 2000 and 2005 and 1.34‰ between 2005 and 2010 against, respectively, 2.55‰ and 1.62‰ in France . The net migration rates adopted by the European Commission for France and Germany are similar, with a contribution to population increase by 2060 on the order of 6% in each country . The UN  uses a similar hypothesis, with the contribution of migration growing steadily weaker in all countries. This reflects a general slowdown in overall international migration due to rising incomes in the originating countries. In this situation, Germany does not seem to have a large pool of external labour available, as it has limited historical links with the main regions of emigration. 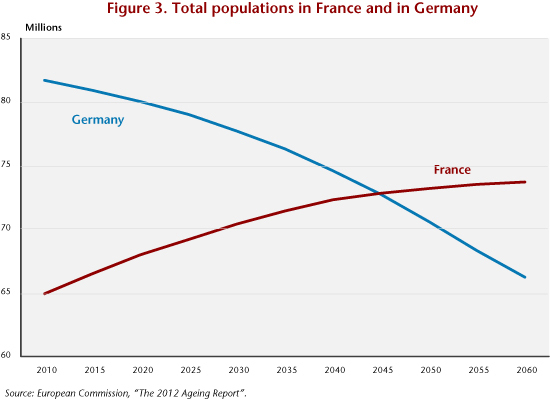 This inversion in demographic weight thus seems inevitable, and it will be accompanied by a divergence in the average age of the population, with considerably more graying of the population in Germany than in France (Figure 4). 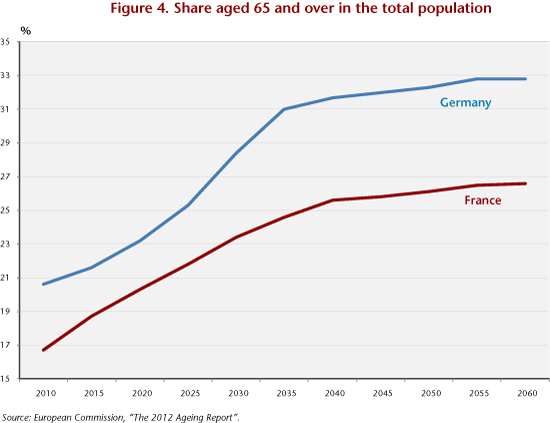 By 2060, the share in the total population of those aged 65 or older will reach almost one-third in Germany, against a little less than 27% in France. As a consequence, and in light of the reforms implemented in the two countries, the share of GDP that goes to public spending on pensions would increase a little in France and a lot in Germany. According to the Report of the European Commission (op. cit. ), between 2010 and 2060 this share would rise in France from 14.6% to 15.1% of GDP, up 0.5 GDP point, but by 2.6 points in Germany, from 10.8% to 13.4%. This is despite the fact that the German reform of the pension system provides for postponing the retirement age to 67, while the French reform postpones it only to 62. Demography also has an impact on the labour market, which will be subject to changing constraints. Between 2000 and 2011, the French and German workforces increased by the same order of magnitude – +7.1% in Germany and +10.2% in France – but while in Germany two-thirds of this increase resulted from higher labour force participation rates, in France 85% of the increase was due to demography. In the near future, Germany will come up against the difficulties of further increasing its rate. Germany’s family policy now includes provisions, such as parental leave, which aim to encourage female employment through a better reconciliation of work and family life, but female participation rates are already high, so that the problem now is more that of increasing the fertility rate than the labour supply. France, which is starting from a lower participation rate, especially because older workers leave the labour market much earlier than in Germany, has greater reserves to draw on. In recent years, the disappearance of early retirement and the increase in the working years required to receive a full pension have begun to have an impact, with the employment rate of older workers rising significantly, even during the crisis . The employment of older workers has also increased in Germany, but it is not possible to continue to make significant increases in this area indefinitely. The most likely result is a long-term convergence in employment rates between France and Germany. Ultimately, then, according to the projections of the European Commission , the German participation rate is likely to increase by 1.7 points between 2010 and 2020 (from 76.7% to 78.4%), while the French rate increases by 2.7 points (from 70.4% to 73.1%). By the year 2060, the French participation rate will increase more than twice as much as the German rate (4.2 points against 2.2). But France’s rate would still be lower than Germany’s (74.7% against 78.9%), meaning that France would still have reserves to draw on. This divergence in demographics between the two countries has major consequences in terms of long-term average potential growth. Again according to the projections of the European Commission (which are based on the assumption of a convergence in labour productivity in Europe around an annual growth rate of 1.5%), in the long term potential growth in France will be double the level in Germany: 1.7% per year by 2060, against 0.8%. 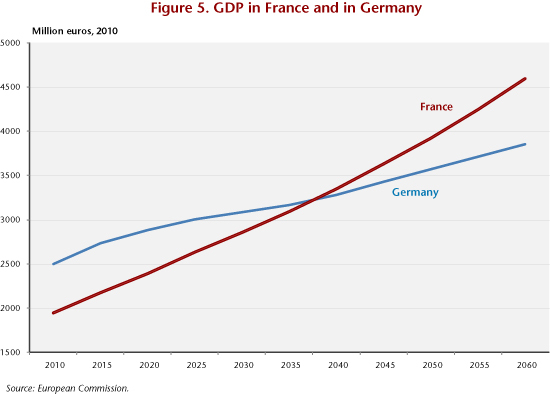 The difference will remain small until 2015 (1.4% in France and 1.1% in Germany), but will then grow quickly: 1.9% in France in 2020, against 1% in Germany. Just as for the population figures, this will result in a reversal of the ranking of French and German GDPs by about 2040 (Figure 5). The demographic situations of France and Germany thus logically explain why there is more concern in Germany than in France for the outlook on age-related social spending. This should lead to a more nuanced analysis of the countries’ public debts: given the same ratios of debt to GDP in 2012, over the long term France’s public debt is more sustainable than Germany’s. Net migration is projected to be slightly higher in Germany than in France, at a level of 130,000 per year in 2025-2030, but under 100,000 in France. But the overall difference is very small: in 2060, cumulative net migration between 2010 and 2060 would increase the population by 6.2% in Germany and by 6% in France (as a percentage of the population in 2010). See the summary of changes in the labour force in 2011 by the Insee: http://www.insee.fr/fr/ffc/ipweb/ip1415/ip1415.pdf . ← Must we choose between saving the planet and exiting the crisis?